"Waiting on" Wednesday, or WOW, is a meme created by Jill @ Breaking the Spine. Join in the discussion to see what upcoming releases we're currently buzzing about. I'm not always crazy about reading historical fiction, but there is something about Mary Hooper's writing style that makes it more enjoyable. It's realism with a little romance in the mix. So far I have only had the chance to read her novel, Grace, but it clearly left an impression on me. I'm extremely excited for her upcoming novel and the cover is gorgeous, as well! A sweeping, romantic, heartbreaking novel set against the backdrop of World War I.
England, 1914. 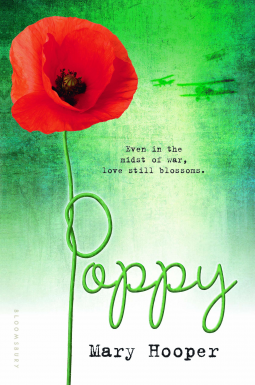 Poppy is fifteen, beautiful and clever, but society has already carved out her destiny. There's no question of her attending more school; it's too expensive and unsuitable for a girl. Instead, Poppy will become a servant to the aristocratic de Vere family . . . and bury her feelings for their youngest son, Freddie. It doesn't matter that Freddie seems to have fallen just as hard for Poppy. He could never marry a girl like her. But the set path for Poppy's life is irrevocably altered when it becomes clear that the war isn't going to be over soon. The chains of class, wealth, and her gender no longer matter--England needs every able bodied person to serve in battle in some way. Which, for Poppy, means volunteering on the front lines as a Voluntary Aid Detachment nurse. As she experiences what people are capable of--the best of humanity and the very worst--Poppy will find an unexpected freedom and discover how to be truly her own person. Mary Hooper is a popular writer for children and young adults. Her historical novels have a huge fan base, as do her contemporary novels for teenagers. Mary lives in England.